Decorative trim, rear door and removable side panels. 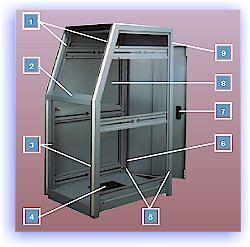 Assemblies include 1 frame, 2 end panels, and rear door. General construction details are the same as the vertical assemblies. The trim is mounted flush with the front outline of the frame. The top horizontal section is 2 1/8 inches wide, covering the face of the frame top. The vertical sections are 5/8 inch wide, mitred at the slope break. To order desired style, add as suffix to the assembly number. 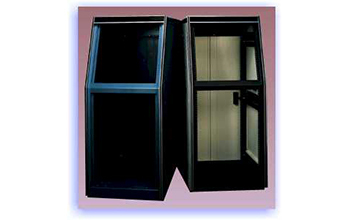 Door mounts left hand or right hand with concealed hinges and is instantly removable. Foam gasketed on 4 sides with magnetic catches on closure side. 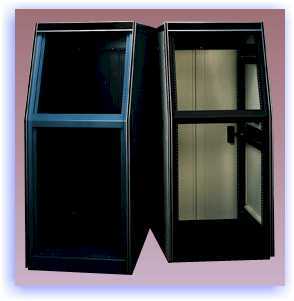 Furnished with a recessed handle, lock and 2 keys.